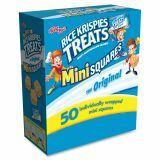 Rice Krispies Treats Original Mini Squares - Crispy marshmallow squares are conveniently packaged in single-serve packs for a perfect treat on-the-go. Miniature size is excellent for sharing with co-workers, family or friends. Each individual package is sealed for long-lasting freshness.